Sunday was an historic day for countryside walkers - marking the publication of maps detailing privately-owned land which has been newly-opened. 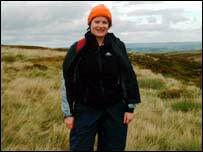 Rebecca Sandles joined a group of eager ramblers in the Pennines. "We'll be walking across the moors that inspired Wuthering Heights, Heathcliffe and Cathy," said MP Gordon Prentice, priming himself for an historic hike. More than 70 years after the celebrated mass trespass on private land at Kinder Scout, a defining event in the "right to roam" movement, ramblers were savouring the dawn of a new era. "It's hugely significant that today we have the legal right to do what the Bronte sisters did all those years ago," said Mr Prentice, a long-time advocate of "ramblers' rights". At a meeting in Haworth's Community Hall, leading lights of the local rambling fraternity were nothing short of triumphant as they gathered on Sunday morning, preparing for a trek across the West Yorkshire moors. For them the right to roam marks the culmination of a campaign dating back over a hundred years. Jerry Pearlman, a lawyer and Ramblers' Association member, was grinning with anticipation. "I had a dream. I stand here today knowing it's come true," he told 60 or so fellow walkers who gathered to mark the day in the picturesque town. "How many of your dreams come true? I haven't come to terms with it yet". For thousands of walkers the dream of exploring moorlands, heathlands and mountainsides that had been out of bounds for generations became a reality at the weekend thanks to the Countryside Rights of Way Act (CROW). On Sunday walkers gained the right to roam on more than 100,000 hectares of land in the South East and North West of England. Maps marking thousands more newly accessible areas will be published in the coming months as more land-owners are legally bound to open their borders. 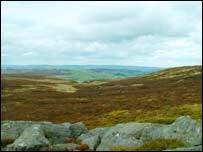 The moors in West Yorkshire are felt by many to be among the finest rambling country you could wish to walk across. And now you can. 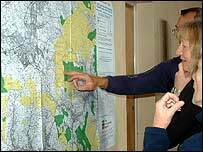 At Haworth, they gathered round newly-printed Countryside Agency map sheet no.SD82, to see just what land had been ruled open country. "We're celebrating joyously the end of a long campaign: to let us loose," beamed ecstatic rally organiser Keith Wadd. "Let us loose after 200 years. Let us loose on the moors." There was an air of victory in the room. It was a return to the days before enclosure, said one speaker. Thoughts turned to the mass trespasses of the 1930s and to more recent angry run-ins with gamekeepers intent on protecting fishing, hunting and shooting land. 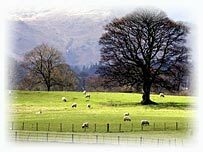 Some landowners are less misty eyed, fearing careless day-trippers and animal rights protesters will abuse the new rights. "People have more right on my land than me! Well, it's getting like that," says Richard Dodd, a Countryside Alliance activist, who farms 800 acres in the North East and Scotland. And even in their dreamlike bliss, the ramblers know access is not quite a battle won, as concerned landowners contest hectare after hectare. But Yorkshire Water, the major landowner of the South Pennine Moors, where it has several reservoirs, was in no mood to stop the rambling party as it headed out of Haworth. Quite the opposite, in fact. The company's environment manager, Miles Foulger, even turned out to join the trek over his employer's hitherto banned moorland. 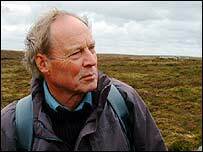 "I feel a real sense of 'let's make this work' for the freedom of access, those making their living on the moors, the wildlife, and of course, for water production," said Mr Foulger. "It needs goodwill, responsible behaviour from all and open honest dialogue." And so I donned my waterproofs and headed across Yorkshire Water land to Alcomden Stones. The stones have apparently long had a mythical status for walkers who could see them on the horizon but were unable, legally at least, to reach them. They're high on the moors and, of course, well away from the route of public footpaths. Now a group of us, from young schoolchildren to hardy ramblers with decades of walking behind them, joined in as we made for the landmark. Event organiser Keith Wadd: "Let us loose on the moors"
"Challenging", is how one member of the party described the route. We weren't strolling in the park. Things can get unpredictable when you leave the footpath. Detractors say walkers risk all sorts of unmarked dangers on the newly accessible land. I'd heard quicksands are one possible fate awaiting a careless boot. "There's not much of that," an experienced walker reassured me. "Even if you did step in it, it'd simply be a bit uncomfortable. This isn't Morecambe Bay!" I learnt a bit about walking on wet moors. For example, aim to put your foot slap bang in the middle of the grass clump. Then, your boot shouldn't disappear in three inches of muddy water. A couple of the group didn't grasp this concept till it was too late. After about an hour on new access land we returned to more well-trodden routes. "It's good to be back on a footpath," said a tired walker ahead of me. Hardly the sentiments of the day, I pointed out. "I suppose not," he replied. "It's hard work though!" That might explain why landowners won't be overrun with hoards of hikers in the coming months. Rambling freely can be hard work. But bouncing along with the sponge-like heather welcoming my every step and the blustery wind pushing me forward, I could almost taste the new freedom.